The train sped into the station with a flash of gold and a huff of steam. A muffled loudspeaker crackled to life, calling out names and numbers as the station was inundated in a flood of departing passengers. The torrent of humanity washed over Detective-Inspector Avaidh Isha with the full force of a thousand uncaring strangers desperate to get home. He ignored the rough jostling. He had more important matters to worry about…for instance, his train ticket. It seemed to be written in some kind of code consisting of numbers and letters, which seemingly bore no relation to one another or to anything else in the station. He scowled at it. It did not become any less cryptic. He glanced up, straining to see over the swift-moving herd of humanity in the dim hope of discovering some sign of where he was or where he was supposed to be. His train was supposed to be arriving within the next couple of minutes–though it could be late. Or perhaps he was late. Or did he have the wrong station? The numbers painted on the station’s walls bore no resemblance to the numbers adorning his ticket. Deeply dissatisfied, Isha returned to scowling at them. Past the general hubbub, the bored-sounding loudspeaker began a new string of names and numbers, which Isha, by some miraculous chance, clearly heard and understood. Kahhi Nihan, Isha thought, head snapping up. His destination. Tightening his grip on his single case of possessions, Isha plunged into the fray and fought his way to the platform. Between the train doors and the ranks of prospective passengers stood a man in unassuming green livery, checking tickets with a vapid expression that seemed to rise above circumstance in a manner similar to a meditating monk’s–save that the monk generally had greater awareness of his surroundings. “Ticket please,” the man recited as Isha approached, and Isha gladly handed off the bit of indecipherable script. “Am I supposed to keep track of your belongings, Kamatar?” the man in green snapped, looking up. Taken aback, Isha was about to rebuke the man when he saw the triangle tattoo of a Behetar on the man’s wrist. His words died in his throat. No matter how low their occupations, the Behetar held a higher caste, and therefore a higher rank, than any Kamatar. “Apologies,” Isha muttered, taking his ticket and ducking onto the train as the Behetar relapsed into glaze-eyed contemplation. As the train rumbled and wobbled to life beneath Isha’s feet, he made his way to the next green-uniformed attendant–a servant-caste Kam Se Kam this time, as evidenced by the small circles inked upon his wrists–who politely informed him that his luggage was indeed settled quite comfortably in the back. With a calmed mind and an uneasy stomach, Isha found his way to his seat, sitting down just as the train gave a decisive lurch forward. One of Upanyaa’s famed hovering railways, the train shuddered slightly, then began to glide without the slightest tremor. Isha watched the landscape outside his window blur as the train began to come to speed, his churning stomach quieting a little. Watching the shaggy grass-ridden hillsides and scrubs of mangroves whiz by, he wondered why he’d ever accepted this mission. It was a pointless question. The commission to bring Saphed Maut, the White Death, to justice–to capture the most successful brigand Upanyaa had ever known–was an honor impossible to refuse. It was a level of respect that had never before been shown to a mere Kamatar, and Isha intended to prove that it was deserved. Of course, he’d accepted before he’d known the mission would involve travel and commanding his own squad of men. He was uncomfortable with both. But the traveling was already underway, and seemed more or less survivable. As for taking on his first official command, he would muddle through as best he could. Saphed Maut was a prize well worth the trouble. Little was known about the origins of the white-clad brigand. Isha had first heard of him in snatches of song on the street, where the brigand’s escapades were put to rhyme by half-starved poets, and the poems put to tunes by riot-happy children. It was difficult to parse the facts out of the stories that were told about the man, and after months of investigation, all Isha knew for certain was that the brigand had a habit of popping out unexpectedly upon travelers and caravans, taking two-thirds (always two-thirds; never more and rarely less) of their goods, and slipping away again like mist in the morning. Of course the legends went further. They painted pictures that seemed the stuff of fairy tales–Saphed Maut escaping from the gallows, Saphed Maut aiding star-crossed lovers to escape their families, Saphed Maut escorting a poor widow across his territory and leaving her with a generous gift of gold. Of course none of the stories could be confirmed–their very nature did not allow for it–but neither could any of them be disproven. For the hundredth time, Isha found himself wondering what had possessed him to accept this commission. Honor was only a powerful substitute for an answer, and it did not explain his fascination with the man. Perhaps there was something in that fairytale figure which simply demanded to be noticed. That was it, he thought. 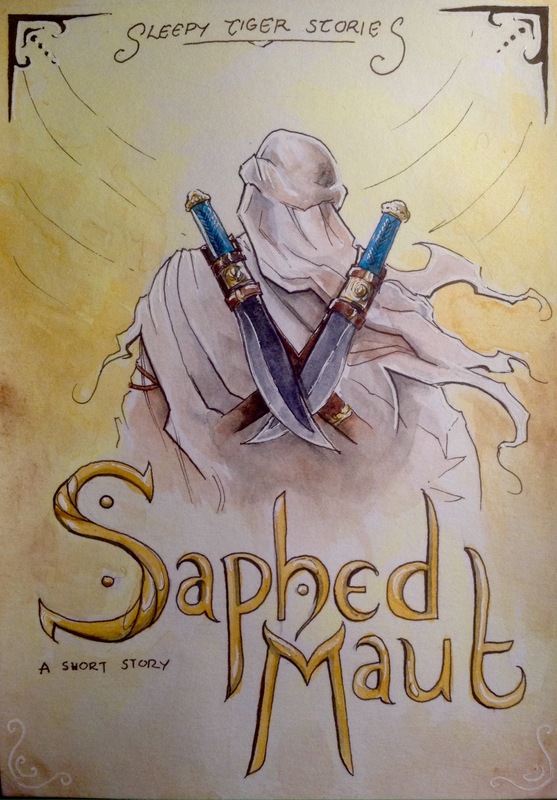 It also explained why a simple brigand was such a priority in the minds of his superiors–for, true or not, Saphed Maut was the sort of figure to inspire such stories. Dangerous stories about nobility and rebellion that the government could not abide. And they were right, Isha ceded reluctantly. Rebellion was never good. Nothing ever came of it but chaos and bloodshed. He turned from the whizzing landscape to stare at the seat-back in front of him. A slim ribbon of one of the brigand’s stories flicked its tail as Isha pushed it forcibly from his mind, and he looked up again, determined to chase away all thought that did not relate to the copper-colored sand or azure sky outside the window. The train lurched. Starting awake to sit up poker-straight in his seat, Isha gripped the arms of his chair just as the great, smoothly operating train screamed, leapt, and halted with a deafening cacophony of shattering window-glass and its nose in the sand-banks beside the railway track. It was all more shocking that violent. When a sudden tenuous silence indicated that the crash was over, Isha took stock of the damage–one old man appeared to have fainted, the porter was nursing a bloodied nose, and Isha was still perfectly safe in his seat. Barely a second of silence passed before the yelling started. A jumble of varied dialects began to jabber to the general effect that everyone wanted to know what was going on, no one did, and someone would certainly have to pay for it. A scream from the pilot’s car silenced everyone. The door between the pilot’s car and their own burst open, and into the gap stepped a man dressed in white. Isha sucked in a breath, not alone in his recognition of the towering figure. Only his eyes showed through the turbaned mask, but they glittered with devilish joy. The whiteness of his robes was broken by the stains of sand and sweat–but the very stains seemed like marks of age and importance, like the tarnish of ancient statues. Cocking his head to one side, the brigand spoke. 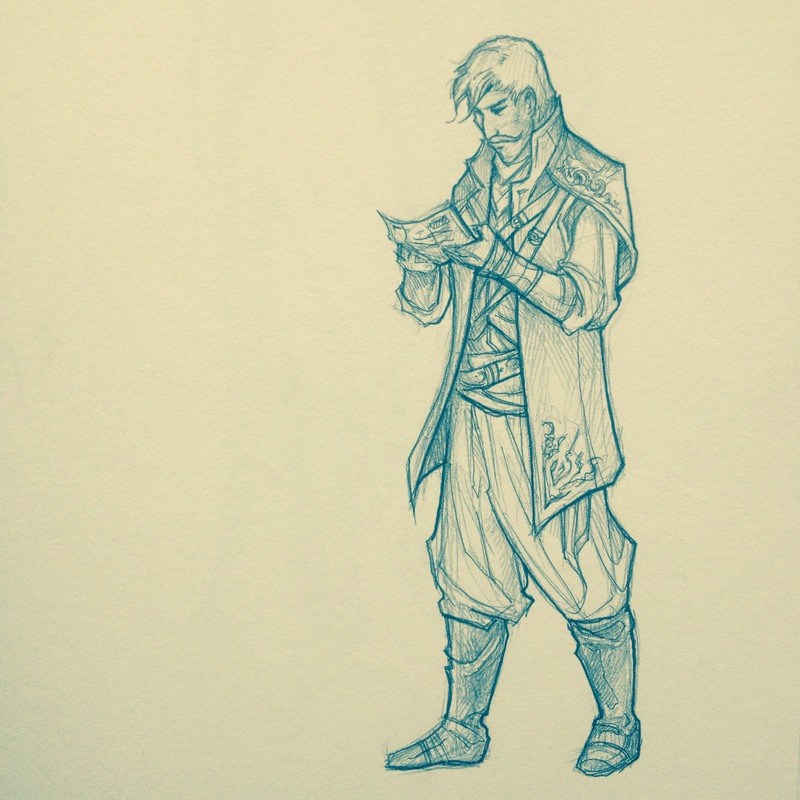 Shifting in his seat with the half-insane idea of getting up, Isha was halted by the click of a flintlock. Turning cautiously, he found a young boy squatting in the sill of the shattered window, fixing him with a white-toothed grin. “Keep to your seat, Grandfather,” he said jovially. Isha raised an eyebrow at him–Saphed Maut wasn’t known to work with partners. The boy wasn’t the only one. Behind the brigand, hugging a sack that was larger than herself, stood a mere child of a girl with wonder-wide eyes. Pinned in place by the gun aimed at his head, Isha watched how Saphed Maut worked. Apart from the conductor who must now be lying dead in the pilot’s car, the brigand didn’t shed another drop of blood. Taking the sack from the tiny girl, he tossed it in the very center of the floor. The edges of the brigand’s eyes gained deep wrinkles as a mask-hidden grin widened. An earring was tossed into the sack, and then a glittering pocket-watch. Isha shifted in his seat, and the boy pressed the barrel of the flintlock closer to his head. The movement, though small, drew Saphed Maut’s attention, and the wrinkles at the edges of his eyes were replaced by a wrinkle between them. The boy huffed, but readjusted the flintlock’s aim to point at the ceiling. Isha found himself looking up into the brigand’s mask. 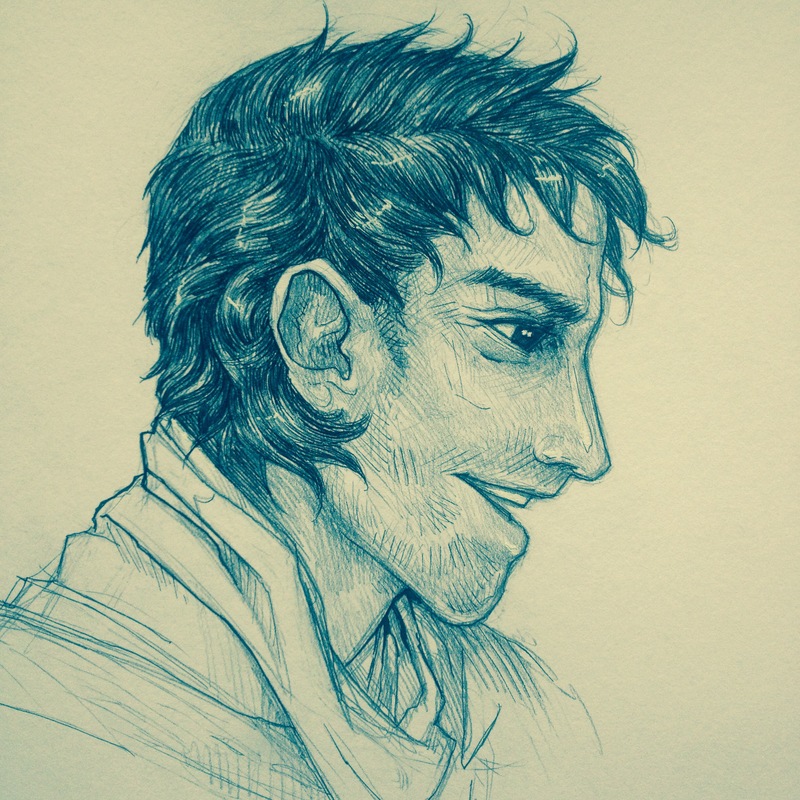 “I’d rather have your gold,” the brigand said lightly. Isha thought of his ‘luggage’, waiting only a car away, and of the pilot’s dying scream. And then he stood, rising until his eyes were level with the brigand’s. The slit in the brigand’s mask showed the faintest glimmer of confusion. “Men!” Isha roared, hoping that his assigned squad of officers were in the next car and not drugged or unconscious or bribed away. Saphed Maut had a talent for foresight. But it seemed that the brigand had not seen this coming. Isha’s officers crashed through the door, flooding into the car, and Saphed Maut all but tripped over the small pile of valuables on the floor in surprise. Seeming to recover himself, he darted forward again, seizing Isha’s sleeve and dragging him off-balance. Struggling against the unexpected attack, Isha found his arms caught in a vice-grip, back stiffening as the brigand’s blade pressed against his throat. The onslaught of officers came quite suddenly to a standstill. The flintlock-happy boy was as wide-eyed as the girl now, and he scrambled to join her behind their leader. Isha swallowed, disliking the way the blade-edge wavered against his throat. Isha opened his mouth to shout that his men ignore what the brigand said. Capture him! Finish the mission! But the tickle of the knife killed the words even as they rose in his throat, and he remained silent. Saphed Maut began to pull him back and out of the train as the officers, glancing at one another, reluctantly stood down. Like everything else that whole unbalanced morning, the rest happened in a flash. One of the passengers, inspired, reached out behind the brigand’s back, seizing the boy as a counter-hostage. The girl screamed as she was grabbed as well. Saphed Maut spun with his unwieldy burden to help them, and one of the officers took the opportunity to fire at his unguarded back. The bullet pinged off the wall of the train, and Saphed Maut ducked. Another shot rang out, and the brigand stumbled, jerking backwards into the pilot’s car and shutting the door behind him. And then the hero–the criminal–fled, dragging the Detective-Inspector with him. Isha’s lungs were not nearly bursting. They had burst, several hills ago, and then he had grown new ones and those had burst as well. They stopped in a little clearing where the morning sun was not as cruel as usual, and Isha allowed himself to crumple onto the ground below a tree, where he panted with slightly less dignity than a dying fish. Saphed Maut did not let him rest long. Rounding the clearing with a string of breathless curses, he turned on Isha, hauling him off his feet and pushing him ungently against a tree. It would all have been very intimidating, but Isha was far too busy being tired to be frightened. “Oh, yes, I silently signaled those civilians with a special code, because of course a couple of street urchins were the very first thing on my mind while I was being held hostage with a knife at my throat!” he snapped irritably. For a split second, Isha thought the brigand would kill him. But then the White Death blinked, shuddered a tiny laugh, and stepped back, letting Isha slide back down to the ground. He rubbed his face like a cat trying to wash itself, unwrapping the mask and letting it fall in a fluttering wave of white to the ground. He was young, Isha realized with a dim sense of surprise. Barely into his twenties. Isha waited in discomfited silence for a moment, feeling that he was witnessing something very personal. The brigand gave a flat half-laugh. Isha frowned, wondering how the man had guessed his rank–and realized that his coat had fallen open during the run, and his badge of office was hanging out of it with undignified precariousness. Straightening it, he sighed. The brigand gave him an odd look. “Jaidev,” he offered, holding out a hand. Isha noted the marks on the man’s palm–a pair of intersecting lines. The mark of the Kucch, the lowest cast of all. There was some speculation as to whether they were even properly human. Gingerly, Isha reached up to clasp the brigand’s hand in his own. Jaidev’s harsh smile seemed to soften somewhat, and he turned away again, walking the little clearing as a beast paces its cage. Isha shook himself into some sense–the children did not matter. It did not matter that Saphed Maut was young, and it did not matter that he was Kucch. 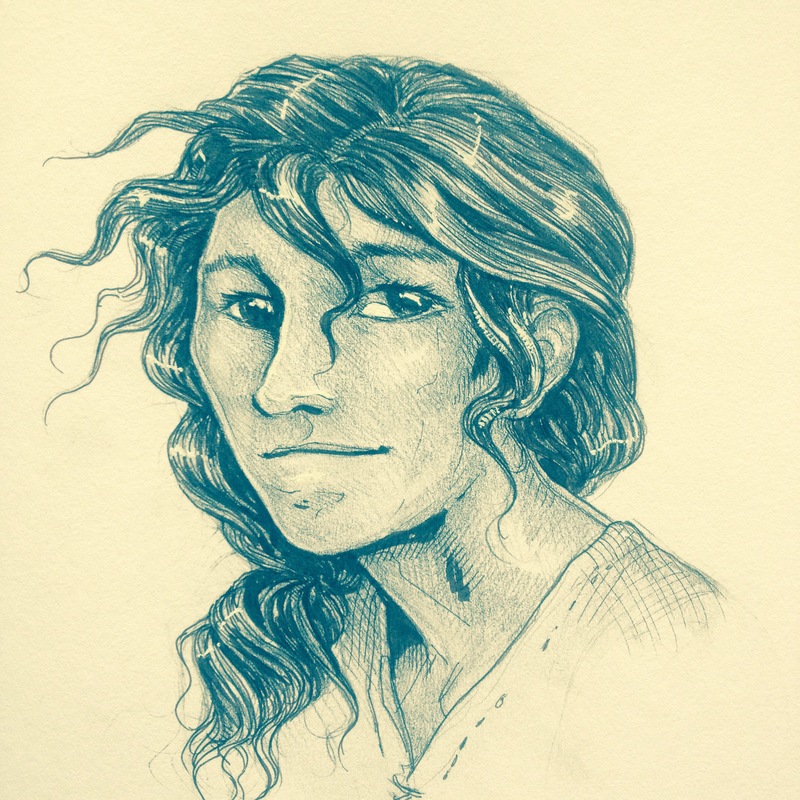 Isha was still an officer of the law, and all that mattered was bringing the brigand to justice. And as unpromising as the situation seemed, Isha had an idea to accomplish it. “You want to save your cubs?” he asked. Isha forced his voice to sound calm, disinterested. Jaidev’s eyes went cold, calculating, and he cocked his head to one side. “Yes. Yes, I believe you would.” thoughtful, he looked up again, into the sun-gilded higher branches of the trees around them, blinking as if only just realizing that they existed, and were beautiful. Then he looked down to Isha again. Technically Isha’s prisoner, Jaidev strode ahead of him towards the small group of police and train passengers still gathered by the crash. He had put the mask on again, seemingly determined to give himself up as Saphed Maut and none other. Isha had been surprised to see the face behind the mask; it was odder, somehow, to see the mask with the face underneath it. Jaidev was a young man who was willing to give up his life for his cubs. Saphed Maut was a thief and a murderer. And somehow, they were both the same man. Startled by the brigand’s approach, the officers by the train stepped back, beginning to huddle in formation. Swords were drawn, and a rifle leveled. Before the confusion got entirely out of hand, Isha rushed ahead, stepping between Jaidev and his own, now very confused, men. “He wants what?” Isha’s second-in-command, a Kamatar who very much resented the appearance of someone he didn’t outrank, said. Isha considered his tone of disbelief out of proportion to the situation, but kept his sheen of politeness nonetheless. Hoishe snorted, eying Jaidev, who stood off to one side with crossed arms and an implacable expression, uncaring of the rifles trained on him. Hoishe raised an eyebrow, then shrugged. He gestured, and an officer ducked into the wreck of the train, coming out again with the prisoners in tow. The girl gasped at sight of Jaidev, breaking free of the officer and running to him. The boy followed, and Jaidev knelt to pull them close. Reluctant, Isha gestured for the officers to seize their charge. “Run now.” the Jaidev told his cubs, harshly, as the men took his arms. The children stepped back, reluctant at first, then turning to flee like rabbits from a hunter. When they were gone, all the fight that was in the brigand seemed to disappear. He let the mask be jerked from his face, let himself be shoved to the ground and his hands tied behind his back. One officer kicked him in the ribs, and Isha stepped forward. “Enough.” he ordered. The officer stood down with a scowl, letting Saphed Maut be pulled to his feet. A small cheer broke out from the few remaining bystanders at the sight of the brigand in custody, but Isha couldn’t muster a drop of pride. Whatever had happened today was not good, and it was not a victory. At best, it was cold justice; and as Isha watched the limp, robed figure escorted away, he could not help but wonder if even justice was too generous a term. The White Death was safely locked away, and for the first night since the advent of his career, the general populace could sleep in peace. Isha, oddly enough, could not sleep at all. Jaidev would be hung in the morning, if all went as expected. A fair punishment for a murderer. Troubled and restless, Isha went over the events of the wreck in his mind until he was sick of them. The lurch. The halt. The scream of the dying conductor. Isha had been surprised by that; Saphed Maut wasn’t known for bloodshed. Blood, Isha thought dully. You would think that there would have been some small splatter of it somewhere on the brigand’s white robes, or on one of the blades he carried. Come to think of it, Isha couldn’t remember seeing a body either. Sitting up straight with the energy of dawning realization, Isha considered, for the first time since the crash, the possibility that the conductor had not been killed. The events fell into place neatly. The train had not crashed by chance, but was guided off the rails by a skillful hand–a bribed hand, perhaps. It fit Saphed Maut’s profile far better than a messy murder. Which meant Saphed Maut was not a murderer. Which meant Saphed Maut did not deserve to die. Heart pounding, Isha ripped himself free of the sweat-grimed sheets and leapt to his feet, searching the floor for the official uniform he’d discarded. Saphed Maut did not deserve to die. And Avaidh Isha intended to make sure he did not. The city prison was not a noisy place, even on the worst days. At night, the only sounds were the quiet shifting of straw as prisoners stirred in their sleep, the click-clack of a guard’s game of dice, and the chirring of rats and locusts. A bat had appeared in the prison earlier, and the yelling of the guards as they scrambled to kill it had been the most ruckus the prison had seen in months. By the time Isha arrived, the bat incident had long since blown over, and the guards had returned to their game of dice. The Detective-Inspector was by and large uninterested in salutes, and glanced briefly at the game. Detective-Inspector Isha shook his head, taking the key without a word and striding down the dark hallway. Badak drew breath to defend himself, but Harjeet only tossed the dice nonchalantly. Isha was trying not to let his nervousness show, trying equally not to look at the straw-floored cells and their quiet occupants. How many people were here? How many people deserved to be? Isha had trusted the law, once. Now it seemed a fragile, easily twisted thing, hard to straighten out and impossible to rely upon. The last cell on the block was the darkest, the lonely light bulb in the hallway having burnt out. In the shadows, it was hard to tell what was straw and what was man. With another glance towards the distant and well-distracted guards and a decisive shake of his head, Isha twisted the key in the lock. The door creaked open, and he stepped inside. It was all straw. The cell was empty. I regret to inform you that I must once again decline your kind hospitality. I have been called out on pressing business, and was obliged to slip away, not wishing to trouble anyone with my affairs. I thank all and sundry for the warm welcome. (Postscript): One of your brethren made remonstrances to detain me, and, my business being urgent, I was forced to resort to unkind means of putting him off. The man can be found in the supply closet just down the hall from my suite, and he should be commended for his vigilance. Isha coughed, suppressing the spasm of laughter that threatened to take his lungs. He read the letter again, and was caught in the throes of another coughing fit. Finally, he folded up the bit of paper and deposited it in his pocket, shaking his head at the empty cell. Then he turned to make his way back to the dicing guards and deliver the horrible, horrendous news that Saphed Maut had escaped. The hardest part would be in keeping the smile from his face. There’s more where it come from. Why don’t you take one of these out for a spin? Loved it. I’m pretty sure I’ll remember the line, “panted with slightly less dignity than a dying fish” for the rest of my days.